Snow Plow Insurance, Whats the Scoop? 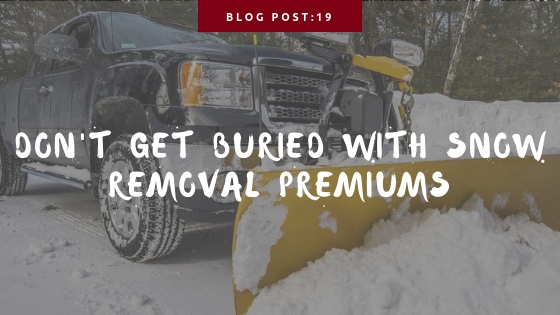 If you’re in the Business of plowing snow you need to have the proper coverage for your vehicle along with other important aspects of your business. Many of the same coverages are required by local laws and often specified by a snow removal contract. With 16 years’ experience and more than 22 trusted providers, we’re able to offer a full range of commercial insurance. We can offer same day pricing for Commercial Auto, General Liability, Workers’ Compensation and many more. Get the coverage you need to protect your business from lawsuits and other liabilities. Do you currently have a active insurance policy? You can get receive rates for your Plow Insurance by visiting our Snow Removal Insurance coverage page. Commercial Auto: Liability and physical damage for your vehicle(s) and attached plow or seasonal equipment. Seasonal Coverage is available for most vehicles with permanently attached equipment. General Liability: The most common form of snow removal coverage. This type of coverage will provide for bodily injury, property damage and other accidents. Most snow removal contracts will require that you have this coverage before the contract is awarded. Workers’ Compensation: Dealing with icy conditions can sometimes result in slippery results. This coverage will provide coverage for you and your employees if a injury or sickness occurs on the jobsite.